Avoid Costly and Risky Cosmetic Surgeries! Take a holisitc approach to natural perfection. Plasma Fibroblast Lift is a revolutionary skin tightening method, which offers perfect facial rejuvenation. Because Plasma Fibroblast is a non-invasive technique, meaning the tool never touches the skin, customers experience minimal downtime and discomfort. Plasma Fibroblast is becoming popular due to its many advantages over surgery. With Plasma Fibroblast Lifting there is less downtime, no cutting of the skin, no stitches and it’s less expensive. This means customers can return to work even sooner. Unlike conventional surgery, plasma treatments do not have the following consequences: anesthesia, seams, swelling, long-term recovery, etc. Above all, surgical methods are much more expensive and complicated. Plasma Fibroblast Treatments deliver results comparable to surgery with a much lower risk at a more affordable price than actual surgery. WHAT IS PLAMA FIBROBLAST AND HOW DOES IT WORK? During the Plasma Fibroblast Lift treatment, a certified specialist uses a device fitted with a tiny needle to deliver heat to the skin to tighten and firm it. The skin tissue is forced to contract virtually immediately by thermally disrupting the skin as well as fibroblasts. This micro-trauma stimulates new collagen and helps release and activate essential proteins and growth factors like cytokines and fibroblasts, which makes more collagen than before it was disrupted. Eventually, excess skin dries off to form tiny crusts that fall off in just a few days. New collagen is formed over a period of up to 6 months. Most, if not all, methods of skin resurfacing are based on creating a controlled skin damage, which activates its healing and this leads to the skin remodeling and improvement in various signs of aging. Even though skin layers get damaged by plasma in a controlled manner (by heating, fragmentation, vaporization – sublimation and coagulation), they do not burn off as they largely do under ablative laser and, importantly, there is no open wound during the healing phase. This is extremely important as this approach reduces the risk of side effects such as scarring, infection, loss of pigmentation etc. After the treatment small dry spots – scabs form. They need 5-7 days to fall off and during this time the client should keep the skin surface clean (use gentle cleanser and lukewarm water) and protect it with after-care cream. Plasma works similarly to an ablative (fractional) laser. On a minute surface of the skin, accurately directed energy damages very specific skin cells to encourage regrowth and renewal. This causes the new skin to generate collagen and elastin fibers, which we lose as we age. This not only improves the skin tone and texture, but it can also reduce scarring, improve a number of common skin problems and increase skin contour. *All subsequent treatments in the same area may be performed at a discounted rate. It is a non-invasive/non-surgical procedure with the same or comparable results as traditional surgery. Before the treatment the topical anaesthetic is applied, ensuring a painless procedure. This innovative technique cannot cause the so-called “overlifting”, as it only damages excess/loose skin which returns to its “original state” after the regeneration phase. A partial effect can be seen immediately after the treatment. You need to wait for 2–4 weeks to see the perfect results. The procedure can be carried out only by a certified specialist. Yes. Anyone interested in Fibroblast procedure is required to have face-to-face consultation. Careful assessment by Prive certified specialist will ensure right treatment plan. Multiple factors affect the aging process. Each person and treated area is different and needs to be determined individually. Our goal is to keep clients informed and meet their expectations. How long is the Plasma Fibroblast procedure? A topical numbing cream is applied to the treatment area to minimize any discomfort. It will take 20 minutes for anesthetic to take effect. The procedure itself, typically takes between 20-30 minutes depending on the size of treated area. (Larger areas will take longer) The duration of the treatment (with anaesthetic application): 60–90 minutes. Professional skincare products with ingredients such as retinol, alpha-hydroxy acids (AHAs), tretinoin(Retin A) or any type of Vitamin A derivatives should be avoided in the days prior to the treatment. Other than that there is no special pre-treatment needed. It is advisable that you do not apply any cosmetic products on the treated area (especially those containing alcohol). During the consultation you should mention all recent surgical or aesthetic procedures. Plasma is a non-invasive procedure with minimal level of pain. It is virtually painless, as the treated area is numbed before the treatment. After the treatment the treated area is red (7–14 days) and some patients may experience some swelling, which may last up to 3–4 days. At the site of each spot a small crust will form. They should not be touched and you should wait for 4–5 days for them to fall off naturally. During the procedure the clients may feel some discomfort, not actual pain, depending on the treated area of the face/body. If you suffer from any of the above mentioned and do not want to go through a traditional surgical procedure, PRIVÉ Plasma Lifting is right solution for you. What areas can be treated with Plasma Fibroblasting? Prive` Plasma Fibroblasting is extremely successful and renowned for the improvement on the eye area. This treatment offers exceptional results for upper and lower lids and crows feet. The excellence of the Fibroblast is not limited to the eye area – the neck, jawline, upper and lower lip, mouth area, jowls, forehead and tummy can all be tightened and lifted with this treatment. Is Plasma Fibroblast Treatment safe? Yes, the treatment is very safe, as it is a non-surgical procedure. It has a negligible amount of possible side effects and serious complications alike. The procedure is based on the natural stimulation of skin regeneration, so the excesses which may be seen in the world of traditional surgery are not possible. Prive` Plasma Fibroblast treatment is already extremely popular across Europe. It is certified by European CE. This means product meets high safety, health and environmental protection requirements. It quickly becomes the choice for those looking into a non-surgical skin lift. Only people who underwent specialized training and hold the Fibroblast Certification by Prive are authorized to perform treatments. You will be asked by Prive professional to fill in and sign consent. All potential side effects will be carefully explained. 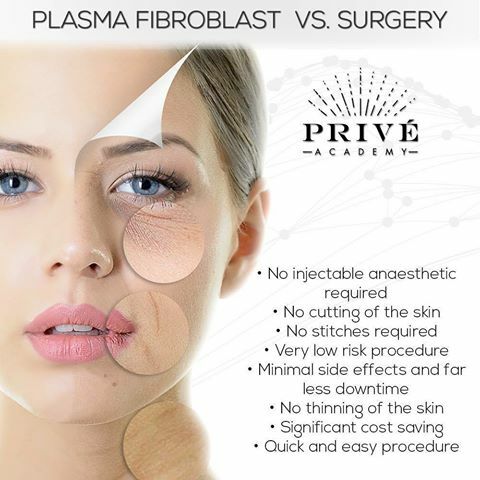 Prive` Plasma Fibroblast treatment is an exceptionally safe procedure with virtually no side effects, or they occur very rarely. Possible side effects are inflammation, scarring or minor change in skin pigmentation, which is very rare. The treated area will often be red and warm immediately after the procedure and can be quite tender for a few days. Clients may experience a tingling or burning sensation, similar to a minor sunburn. It is highly important for each client to follow the instructions for aftercare closely. Carbon crusts, or tiny superficial dots, form directly on the skin, and are part of the normal healing process. When proper aftercare is followed, these carbon crusts will fall off 5 to 7 days after treatment. Mild swelling is common and expected during the first 3 days. This can be significant around the eyes and can last for several days and may lead to interference with vision in the initial period. The swelling is usually entirely gone by day 5. Do not pick carbon crust; it will fall off in a few days. Clean the treated area with Octenisept or antibacterial soap twice a day. After the treatment continue applying the aftercare cream on the treated area as long as it is sensitive or when you are exposed to sun, as it contains SPF and protects the treated area. Avoid sauna, pools, solariums or any kind of exposure to activities which present risk for infection of the treated area. Make sure to protect the treated area from direct sun until the skin is completely regenerated (2–3 weeks). Do not apply products containing alcohol or other scents. Until the crusts fall off, you may apply colloidal silver to prevent inflammation. Do not cover with plasters. Prive Aftercare cream should be reapplied to the area. Keep the treated area clean, away from excessive moisture. Drying the skin by dabbing with a clean, lint-free cloth is allowed. Mineral make-up may be applied from the third day of the treatment onwards. Avoid exposing the area to extremes of heat or cold until it has healed. Healing skin should be protected from direct sun with a broad spectrum, high SPF sunscreen. Sports, swimming and sauna are not permitted until crusts fall off. This should happen within 7 days of procedure. In the case of excessive swelling anti-inflammatory medication and/or anti-histamine may help alleviate the swelling. Do not use makeup after the treatment, as it generally is not sterile. First 5–6 days after the treatment, until the crusts fall off, use the antiseptic product and the aftercare cream, applying it softly to the treated area. When the crusts fall off, you may apply some makeup if necessary, as the cream the therapist gives you contains skin powder which covers the crusts and the blush. Mineral make-up may be applied from the third day of the treatment onwards. Are the results visible immediately aftter the Plasma Fibroblast treatment? The results are visible immediately after the treatment, but the maximum results will be visible after 3–4 weeks when the skin enters the third phase of the healing – collagen and connective tissue growth. So, results are visible immediately, but the end results follow after 3–4 weeks after the treatment. In some cases, clients may need more then one treatment. This depends on treatment area and skin condition as well as desired outcome. In some cases just one treatment may be sufficient, especially with lighter corrections. Many of the treatments will depend on a size of the treated area and customer’s desired degree of correction. Full effect of the first treatment will be visible after 3-4 weeks following the procedure. If client requires additional treatment to achieve optimal results those should be scheduled at 6 to 8 weeks intervals. A face-to-face consultation is required in order to evaluate the number of treatments needed to achieve desired results.